With 24 levels, mazes that, at times, seem endless and puzzles that need solving, DOOM is the type of game that'll keep you occupied for weeks. And give you nightmares in the process. I'm telling you now; you can keep your fighting game knock-offs and your action/platforms. This industry needs creativity to survive and there's no better yardstick of that right now than Doom. So what are you waiting for? Set the magazine down and run, don't walk, to the nearest retailer to pick up a copy of Doom. You can thank me later. Avec le mode 2 joueurs, Doom est encore meilleur. Voilà une bonne raison d'acheter une Jaguar (et même deux)! Nie do uwierzenia, że po Wolfenstein 3D i Alien vs Predator udało się zrobić tak świetnego FPS'a na Jaguara. Technicznie Doom odsadza te pozycje o lata świetlne. Grywalnościowo też jest bardzo dobrze – rozpierducha bez zbędnego zastanawiania się kto, co i dlaczego. Z miejsca widać że na Marsie zaległy się bestie i trzeba je zaciukać nie doszukując się w tym jakiejś głębszej filozofii. Der Jaguar in Höchstform. Id höchstpersönlich nahm sich dieser Konvertierung an, zog 23 Original-Levels 1:1 herüber und kreierte zwei zusätzliche. Bis auf seltene Geschwindigkeitseinbußen spielt sich die Umsetzung ebenso phänomenal wie das Vorbild und nutzt als erstes Spiel das enorme Leistungspotential der 64 Bit-Maschine. Einzig die fehlende Begleitmusik kann man als Kritikpunkt aufführen, trotzdem ohne Zweifel der erste wirkliche Jaguar-Kracher. Doom versöhnt alle Jaguar-Besitzer. Wenn es ein Spiel gibt, das Ataris Raubkatze wirklich ausreizt, dann ist es, neben Tempest 2000, zweifellos dieses 32 MBit-Monster von id; und wer die ersten Levels erkundet hat wird sein (innig geliebtes) AvP wohl nur noch als Türstopper mißbrauchen, denn Doom ist einfach obergrell. Gerade die spielerische Tiefe ist es, die den Reiz dieses Moduls ausmacht. That said, I would like to start things off by saying that both the Jag and SNES versions of the game are amazing. Obviously, the Jag version of the game is better, but the 16 bit SNES port does have a few things over it's 64 bit (for purposes of getting through this review without putting anyone to sleep, I'll use Atari's math) rival. Finally, many Doomers would argue that the game found it's ultimate expression as a multiplayer "fragfest" played over a modem or network. While Doom by modem is planned for the Jaguar and Cooperative and Death Match modes are included on the cart, modem support won't be ready until January. Either way, you can't go wrong. Doom is a memorable experience when played solo. With another player, it should be absolutely wicked. Das ist Jaguar-Power pur! Das Kult- und Lieblingsspiel der BPS ist seit geraumer Zeit auch für den Jaguar erhältlich. Diese Version zeigt die gewaltige Rechenpower der Raubkatze. Doom läuft in 16-Bit-High-Color (65536 Farben) und macht einen schnelleren Eindruck als auf dem PC, obwohl hier nicht nur in einem kleinen Window, sondern auf der gesamten Bildschirmfläche gespielt wird. Insgesamt enthält dieses 32 Mbit-Monster-Modul 23 Level + verstecktem Bonuslevel, der in jeweils drei Level gefunden werden kann. Jeder dieser Level ist bis ins letzte Detail perfekt durchdesignt. Es gibt sowohl Schlüssel, Waffen, Heal-Packs sowie etliche Geheimgänge in den einzelnen Level. Doom pro Jaga sice vychází z původní verze Doom I (PC), ale přesto se v mnohém liší. Setkáte se zde s většinou starých známých kamarádů, s výjimkou dvou posledních monster - Cyberdaemona a Spider Masterminda. Většina prostor, ve kterých se hra odehrává, je také dobře známa z původní verze, nicméně mnoho detailů je řešeno jinak. Příjemným překvapením je i přidání mnoha nových scenérií. Zbraně i automapping zůstaly oproti PC beze změny. Největším překvapením pro mne však byla rychlost a naprostá plynulost, s jakou Jaguar hru zvládal - vše odpovídalo velmi rychlému PC (asi 486 DX2/66). A to vše na velké obrazovce, což je nesporná výhoda proti hraní na 14-ti palcovém monitoru. Grafické provedení a zvuky jsou naprosto stejné jako na PC, jen nechápu, proč ve hře nebyla hudba! [...] Druhá, ale zároveň poslední, výtka je na adresu funkce "save". Sejvovat se totiž nedá v libovolnou chvíli, ale pouze se do paměti automaticky ukládá stav hry při dokončení každého patra. The definitive version of Doom is probably on the PS1 (1995) but this port is still very respectable. It does have some minor issues with the frame-rate and lack of music but the gameplay is still just as gripping and the lengthy campaign will have you playing for a while. It's only recently that console ports have been expected to have some form of unique content or a reimagining of its computer-based original to make them worth purchasing. In 1994, it was enough of an accomplishment simply to have a cheap(er) console accurately play a game designed for the PC. That's what you get with the Jaguar port; nothing more, nothing less. The PC original still feels more polished since it was the intended and designed system, but if this was your only option, it was and still is a great way to play Doom. By far superior to all other home systems, this version of Doom still doesn't match the PC original. If you don't have access to a PC, you can't go wrong on this classic. I found the lack of music to be the biggest downfall to this otherwise wonderful game. Although Doom is a good visual representation of the incredible PC game, there are some notable losses that diminish the fun factor. Most notably, some of the levels have been axed. Also, the music is missing, although it was never anything exciting anyway. The control is decent, but it does take some time to get used to the slippery control. Otherwise, it's a decent game and one of the better ones to come out for the Jag. 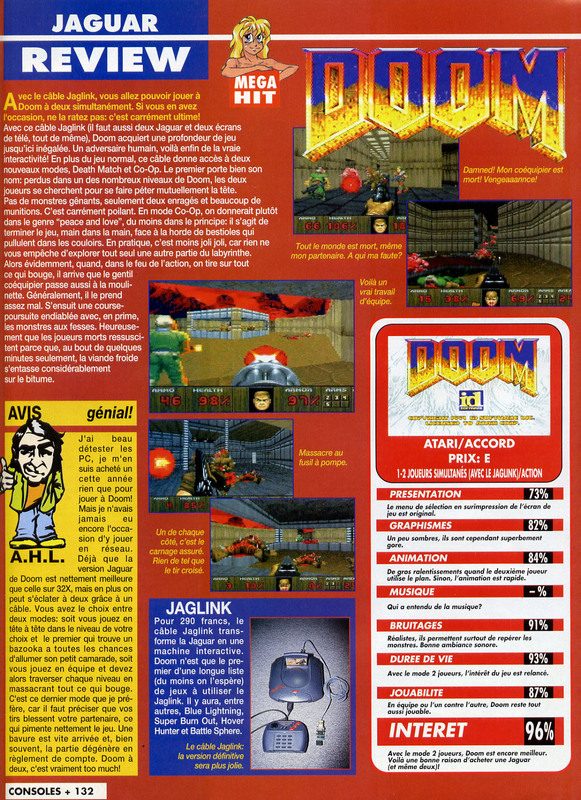 Doom on the Jaguar misses the online boat, but it does feature quite a few features new to the home consoles. For the first time, Doom was playable in FULL SCREEN FORMAT! Plus there wasn't any music, which by the way is a major improvement! Some of the levels and characters had changed a little, but the game was still a load to play. This is not THE first person shooter to own on the Jaguar, perhaps on the 32x, but not on the Jaguar. If you're looking for a good first person shooter, look no further than Alien vs. Predator! Of course, the best way to play this one is the PC version. The Jaguar port is one of the better renditions of the classic game on a console (especially as far as cartridge versions are concerned). This will all depend of course on whether or not you can locate the overlays and can live without the music. If not, and you're dying for some FPS action, then there is always a blistering translation of Wolfenstein on the Jaguar that is just superb. There are better versions of Doom out there, but this one certainly gets the job done.